The rooms are spacious -about 45 square metres- , comfortable and well furnished,they have private bathroom and they can accommodate 4/5 people. You will find a wide and comfortable quadruple attic Suite that will welcome you in a equilibrated harmony of colours, parquet floor, details researched, a relaxing and discreet environment. 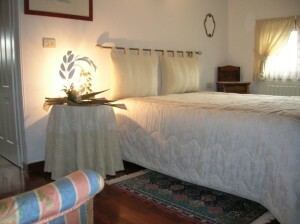 You will have at your disposal a sleeping area with double bed and an area with two single beds. There is a studio area, furnished with a large desk where you can find some brochure and information about the city of Turin , and you can use free Wi-fi. You will find a wide, unique area of 45 square metres, furnished with style, a particular care in the choice of the fabrics and in the combination of colours that contribute to create a warm atmosphere that evocates the ancient tastes, with details that will make you feel at home. 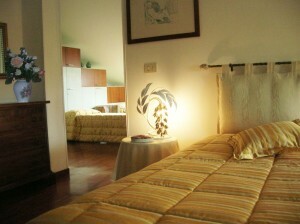 The room is furnished to give hospitality to 4 people; it is furnished with a double bed and two single beds. 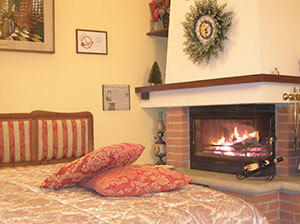 In the room you will enjoy the suggestive fireplace that will be lighted in the cold winter nights to let you cuddle by the warmth of the fire and spending very beautiful moments. 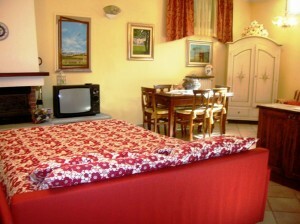 This Quadruple room can be requested as Triple, as Double, or double, Single use. All rooms are for no smokers. You can smoke in the porch and in the garden. Check-in from 2 o’clock p.m. and departures by 10 o’clock a.m., unless previous arrangements have been made.